Have you ever tried Walking Meditation? 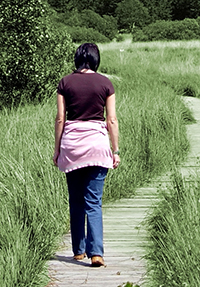 Here’s an article that highlights 3 ways to practice walking meditation. Do you find walking meditation more difficult than sitting silently? For me, I find both just as beneficial. Walking while meditating often gives you the feeling that you are one with the Earth and God. The soft rhythmic sound that your feet make as they hit the ground can often times be soothing, a way to get you to focus on your mantra. This entry was posted in Uncategorized and tagged contemplative living, photography as a christian contemplative practice, prayer and meditation, spirituality, walking meditation. Bookmark the permalink.